Every now and then I publish a recipe here without much fanfare. This one is a standard: Cornbread. I’ve adapted the recipe from The Joy of Cooking (Northern Cornbread). A few prompts and the recipe are below. Grease a 10 inch cast iron skillet, a 9 inch round cake pan, or a standard 12 cupcake pan. In a separate bowl beat the eggs and then whisk in the buttermilk. Fold in the oil (or use melted butter) OR melt the leaf lard in the skillet in the oven and tip the pan to coat it evenly once the lard is melted. 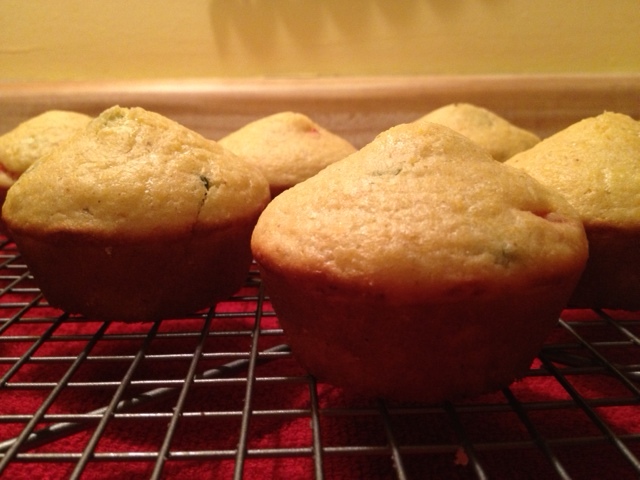 Scrape the batter into the pan and tilt to spread evenly (or fill the cupcake pan 2/3 full). Bake until a toothpick inserted in the center comes out clean, 10 to 12 minutes in a muffin pan, 20 to 25 minutes in a square pan. Serve hot. Note: you can also add a half cup of grated cheddar cheese and 1/3 cup sautéed bell peppers. I did this in the muffins pictured above.